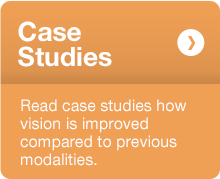 Transform your post-refractive surgery patients’ vision. In 2015, SynergEyes introduced UltraHealth FC, a second generation hybrid lens, indicated for post-surgical, refractive error and trauma. 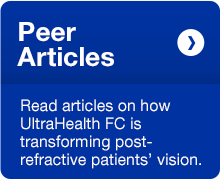 UltraHealth FC is designed to give your post-refractive patients and patients with oblate corneal surfaces an unprecedented combination of vision and comfort while helping to maintain eye health. Same advanced technology, aspheric, hybrid lens design of UltraHealth hybrid contact lens, but with flatter base curves starting at 35.50D. Second generation design with SoftCushion® comfort technology enhances tear exchange and lens movement. 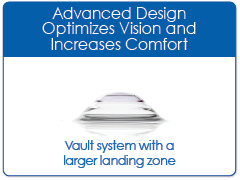 Variable-lift design combined with a vaulted fitting philosophy allows for clearance of corneal irregularities in corneas with oblate surfaces. 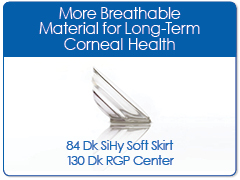 Designed to provide an additional contact lens choice for post-refractive surgery patients. Hybrid design provides ideal centration compared to GP lenses. Tangible™ Hydra-PEG coating provides increased lubricity through a highly wettable surface.